Clemency Smittson - Smitty to her friends - was adopted when she was a baby. She doesn't remember her birth family and the only thing she has to tie herself to them is the box decorated with butterflies that she was given away in. Smitty was born in Brighton, but grew up in Yorkshire with her adoptive parents. Now thirty-seven, Smitty is moving back to Brighton to start again after the breakdown of her relationship. Through her work, Smitty comes into contact with someone who knows about her past - and the family who gave her away. As Smitty begins to piece together her past, the truth of what happened to her birth family starts to surface and events begin to spiral out of her control. Smitty questions whether she should have sought the answers of where she is from, but it is far too late to stop and there is no way of going back. 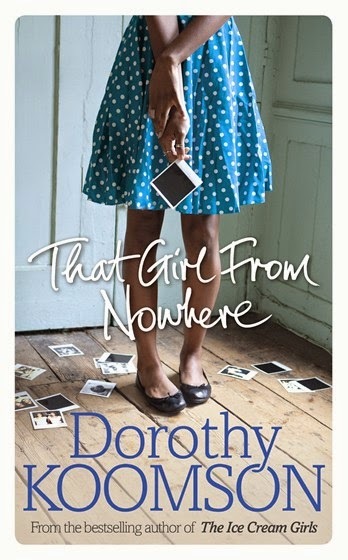 As a massive fan of Dorothy Koomson, I've been itching to read That Girl From Nowhere. I know that once I sit down with a Dorothy Koomson book, I'm going to be quickly drawn into the characters' world, hooked by the beautiful writing steeped with emotion and intrigue. And That Girl From Nowhere was definitely no exception. I was immediately pulled into Smitty's world and felt her struggle with the world she only felt a tiny part of and the one she had been rejected from as a baby. There are so many complex relationships within the book; friendships, lovers, parent and child and siblings, and Dorothy Koomson manages to explore each of them in such a compelling way that you find yourself fully immersed in them, experiencing the array of emotions involved. At times I was angry with certain characters, only to later find myself thawing towards them as we learn more about them and why they behave as they do. Although the book is mainly told through the perspective of Smitty, I did feel that I had a pretty rounded view of all involved. For me, one of the most interesting relationships was between Smitty and her adopted mother, Heather. Heather can be so overwhelming in her need to control Smitty, almost treating her like a child at times, but I could understand her fears for her future with her daughter, especially as I delved further into the book. Heather is quite an unlikable character at times, but it isn't simply a case of her being a bad person - life and people are far more complex than that and Dorothy Koomson has a knack for capturing this perfectly. Of all the relationships within the book, my favourite was between Smitty and her adoptive father. While Heather could be quite strict and didn't always 'get' Smitty, her father simply accepts his daughter for who she is, supporting her no matter what and I adored their bond. Smitty likes to take polaroid photos, which she displays on her wall, creating a map of her life, and this was one of my favourite parts of the book as it allows the reader to dip in and out of Smitty's past. I also loved Smitty's job of changing old, once-loved jewellery items into more wearable pieces to suit the client's current needs. I found it quite symbolic that Smitty would take something abandoned and unwanted and re-shape it into something beautiful for the wearer to love once again.